Hurricane season takes place each year from June to November. 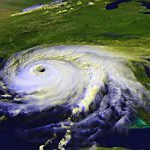 After the most recent and devastating tropical cyclone in the U.S. hit in August 2005, Hurricane Katrina, we all can’t help but associate the month of August with hurricanes. Click here to see TIME’S Most Destructive U.S. Hurricanes of All Time. These strong storms with their intense winds and heavy rainfall are catastrophic. Not only is driving safety #1 at Smith Transport, but all sorts of safety–that includes hurricane preparedness. Whether you’re a truck driver away on the job or at home, it’s important to be prepared for Mother Nature at all times. Because no matter what area/basin you live in (Atlantic, Pacific or Indian), a destructive storm could strike. If history has taught us anything, we know lack of hurricane awareness and preparation are common threads among all major hurricane disasters. By knowing your vulnerability and what actions you should take, you can reduce the effects of a disaster. If you plan to shelter your pet, work it into your evacuation route planning. Animals brought to a pet shelter are required to have: proper I.D., collar and rabies tag, a carrier or cage, a leash, any necessary medications, and specific care instructions. Pet shelters are typically filled on first come, first served basis. Smith Transport hopes these disaster prevention tips have been enlightening and helpful. This August, take the necessary precautions to protect your family and your home during hurricane season. Interested in driving for Smith? Give one of Smith Transport’s recruiters a call at 866.265.3718 or take a moment to apply online. Smith recruiters are standing by!